Gravity Dice appeared on my radar at Phoenix Comicon 2017. Wandering the halls, I ran across these lying on a table. 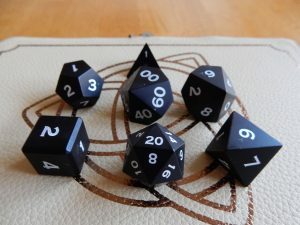 There is a trend toward metallicized plastic dice that look like metal dice, but roll (and cost) like plastic dice and I almost walked past them. Closer inspection revealed that these were truly metal dice. I quickly bought a set and this is my review. Gravity Dice manufactures their metal dice sets from aluminum and anodizes them in multiple colors. Most metal dice etch/cut numbers into the face of the die. This always annoyed me as it is likely it threw the balance of the dice off. The “1” face had less material removed than the “20.” Gravity Dice resolved this issue by using a laser to remove the anodized coating to expose the underlying material. This means the numbers are laser sharp and the amount of material removed is barely measurable. The aluminum alloy makes for very light dice, but still heavy enough they do not jump out of my dice tray. Gravity Dice’s owner comes from an aerospace fabrication background and produces some of the most precise dice I have ever seen. The anodized coating is sharp and clean and to my limited testing, durable. That said, I would not throw these in a dice bag without some protection. I keep mine in my Elderwood Academy box and it has foam cutouts for each die. The only real drawback to these dice and it is a complaint across most metal dice sets; the d4 is sharp! Other than that, I love these dice. They are now my “daily rollers” and I retired my Crystal Caste Dwarven Metal set. I cannot recommend these dice enough and I highly suggest you check out the Gravity Dice website. Disclosure: I paid full retail for these dice.